So, you want to get your teeth straightened with Invisalign? We know you’ll have lots of questions, that’s only natural. This page is a collection of our patients frequently asked questions about Invisalign and Invisalign Teen. If you have another question we haven’t answered here, ask us to add it to the list and our orthodontist will answer it for you. There are many causes of gaps in between the teeth. From an abnormal jawbone growth to missing teeth, the gap itself is not just a visual impairment; it can also cause more dental issues, including gum disease. For this reason, you may wish to consider Invisalign for the gaps between your teeth. Invisalign are invisible aligners that are worn over your teeth. These are made to fit out of comfortable, plastic materials that are virtually impossible to detect by others. The aligners offer a gradual shift of the teeth and will close the gap between your teeth. In many cases, the gap between teeth disappears quicker than if traditional braces were worn. The main benefit for Invisalign users, however, is how easy the process is to eliminate the gap between the teeth. With no wires to get attached to your teeth and no appointments for tightening, the process is quite simple. You will wear an aligner for approximately two weeks and then switch to the next aligner. The best part is that because they are invisible, people will not realize you are wearing them unless you choose to tell them yourself. Once your treatment is finished, you can enjoy your gap-free smile. Crowded teeth can give your mouth a look that you might not desire. Invisalign treatment can help give you the straight smile that you want while easing the overcrowding in the mouth. There are a few components to consider when Invisalign is used for crowded teeth. One or more of the teeth might need to be pulled, or some of the teeth might need to be shaved on the side in order to make room for the others to move properly. If the teeth are shaved for Invisalign treatment, the dentist will only remove the smallest portion possible. Another option is enlarging the arch in the mouth. This is done by using expanders either before treatment begins or during the process. Once there is room in the mouth for the teeth to move, the braces are placed. Then it will be easier to see the results that you want. Some of the teeth can become crooked if crowding is left untreated. This method of treatment is beneficial for those who don’t want others to see their braces. Crowding can also lead to excess plaque buildup because some of the teeth will overlap, making it hard to brush efficiently. 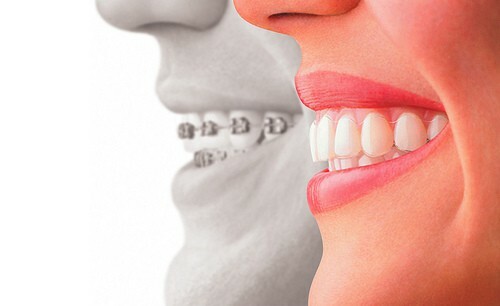 The braces will help in giving proper spacing so that the best oral hygiene can be provided. If you have an open bite, it can affect not only how the teeth look but the function as well. It can cause issues with chewing if you don’t get the issue resolved. One way to resolve the problem is with Invisalign. These are clear braces for the teeth that do the same work as traditional metal braces. When you have an open bite, the top teeth don’t make any contact with the lower teeth. This makes it look like there is a space between the top and the bottom teeth. The top teeth could also be over the bottom teeth. Invisalign can help move the top teeth back into a place where they are properly in line. There could be a bracket or two applied to the teeth so that an elastic band can be used to move the teeth. It does not take a long time to complete the orthodontic treatment to correct an open bite. If the condition is not treated, it can lead to pain in the mouth as well as pressure on the back teeth. Speech impairments could also be seen with this condition until Invisalign treatments are completed so that the teeth are in the correct alignment. Invisalign is an innovative, almost invisible orthodontic option. It involves plastic, custom-made aligners made specifically for the person who will be wearing them. By gradually moving the patient’s teeth with the aligners, the desired orthodontic outcome can be established. Metal wires and brackets used with traditional braces can be uncomfortable. Invisalign is barely noticeable. Every couple ofweeks, a new aligner is made to help in the teeth straightening process. This fairly new option in orthodontic treatment is suitable for many dental issues. Mild or more severe oral problems can be addressed with aligners. Treatment for top teeth only is also referred to as single arch treatment. Invisalign for top teeth only is a positive option for people suffering from crossbite. Crossbite is when the upper teeth are situated behind the lower ones. Having an overbite is another option for using aligners on the top teeth. Some patients with space between their front teeth and an overbite can benefit from aligners for upper teeth only. This single arch treatment can address and correct both issues. When bottom teeth are straight and the patient feels generally pleased with those teeth, aligners used on the top can prove conducive to a future beautiful smile. Temporomandibular joint (TMJ) disorders are caused by what is often called a “bad bite.” This means the teeth are not aligned correctly because the joint in the jaw is misaligned. Common causes of TMJ are teeth grinding, jaw clenching, injuries including whiplash, and arthritis in the joint. TMJ can be quite painful. Invisalign can correct the bad bite that leads to chronic TMJ pain. You should have your TMJ evaluated by a qualified orthodontist, as treatments can vary depending on the severity of the TMJ and the type of bad bite experienced. There are different ways the orthodontist may choose to treat the TMJ and there can be different stages in the treatment. Depending on the needs, it is not uncommon to begin with Invisalign only on the top teeth while assessing how much it is able to help with the TMJ. There are also other treatments that may be combined to provide the necessary jaw alignment or assist with correcting the bite. Every individual’s situation is unique and only an orthodontist can properly determine the best way to move forward. TMJ is treatable and no one need continue to suffer the pain, swelling, and other difficulties. Invisalign is an excellent option to begin treatment in many cases. An orthodontist has the option to use Invisalign or braces to straighten their patients’ teeth. Teeth are straightened to achieve an ideal position, improve a person’s looks, and to promote proper functioning. The Invisalign technique employs a set of clear plastic trays that helps teeth achieve their desired position. Traditional braces use metal wires to achieve the same goal of tooth alignment. Both dental correction methods are good at straightening teeth. If tooth movements are not too complicated to fix, a computer-generated tray can be ideally worn for 24 hours. Change outs are required every two weeks. Some trays can last up to one year. In this instance, some type of retention may be needed to keep teeth from shifting back to their original form. Clear trays are virtually invisible and provide an excellent way for people to correct their teeth without anyone knowing they’re wearing braces. There’s also an element of comfort which doesn’t affect one’s speech. Where complex teeth issues are involved, braces are functional and one of the most effective treatments. Gaps between teeth are more easily closed and teeth can be aligned more quickly. It’s a trade-off and the decision to choose one over the other is best supported by your orthodontist. Your orthodontist can provide information on products, procedures, and costs. Invisalign and clear braces are two examples of treatment methods that provide a dental patient with a high level of discretion. The difference between Invisalign and clear braces is in the material. Invisalign is a teeth alignment correction system that consists of several sets of clear plastic aligners. The patient can freely remove the plastic aligners to brush the teeth or to eat meals. The plastic aligner system helps the patient to keep the teeth clean during the treatment period. Clear braces are different from aligners because they are non-plastic devices. They have brackets that are teeth-colored so that no one can see them. They may be constructed of a ceramic material or another type of clear material. Clear braces may have a stronger foundation than plastic aligners. Treatment with plastic aligners is shorter than treatment with traditional braces in most cases. Patients and orthodontists can see significant results in as little as 9 to 10 months. Clear braces and plastic aligners provide the patient with the utmost level of privacy and discretion. They are an excellent choice for high school students and persons who have high-profile occupations that require them to speak with many people. An interested person can contact an orthodontist to discuss clear treatment options today. Dental patients have several choices for correcting slight teeth alignment problems. Two of the choices that they have are Invisalign and veneers. Invisalign is an alignment correction system that uses plastic aligners. The process for obtaining the plastic aligner system starts with a consultation between the orthodontist and the patient. The orthodontist will examine the patient and decide whether the plastic aligner system will be the best corrective option. The specialist will have to take an impression of the patient’s mouth and create a system that contains many sets of aligners. The patient will change the aligners every two weeks during the treatment period. Veneers are different from plastic aligners in that they consist of a thin material that covers the surface of the tooth. Veneers can work for stains and slight alignment issues. The placement of dental veneers usually requires two office visits. The specialist will first shave the surface of the front of the teeth. Next, glue is placed on the area so that the veneers can go on the front of the glue. The patient will wear a temporary set of veneers until the dental office prepares the final set. Both methods of alignment correction can work. The plastic aligners are better for mild problems, and the veneers are best for simple problems that have a quick solution. While both Invisalign and traditional metal braces successfully straighten teeth, they are not without their differences. Invisalign is best at correcting spacing between teeth, but braces are capable of fixing issues that the clear aligner may not be able to correct. Some of these problems include very overcrowded teeth, badly rotated teeth, and teeth that are vertically out of place. The comfort level of both alignment methods also differs. Braces are often uncomfortable, as the wires and brackets can bother the wearer’s cheeks, requiring the use of wax to prevent irritation. The clear aligner does not require this at all, as it is worn over the teeth to achieve the same effect as metal braces. Moreover, it does not prevent the wearer from eating certain foods. Braces can break if the wearer eats something that is too hard, and they can trap food behind wires and in the brackets. Normally, the teeth can be cleaned of this food through proper flossing and brushing, but braces can prevent that as well, leading to a potential decline in the wearer’s dental hygiene. Invisalign does not impede the wearer in this way, as the aligner can be removed at any time to allow the wearer to floss and brush normally. Have any more questions relating to orthodontics? Why not give our office a call?